First things first: we celebrate Christmas Eve rather than Christmas Day. Yes, we do not torture our children by having them wait the entire night for the presents. Oh, the sleepless nights saved! Our main meal is fried carp with potato salad. Carps are being sold during the week leading up to Christmas on the streets from barrels full of water and fish. Today the vendors will kill and filet the fish on the spot, but when we were kids, parents would buy a live carp and have it in the bathtub until the Christmas Eve so that it was fresh when we ate it, which meant you had a little pet for a week... and then you ate it. Taught you a lesson. Never trust your friends. Zuzi's little brother used to take baths with the carp and liked to kiss it… and hasn't eaten a single one since he realized what happened to it later. The potato salad is also a serious matter that has been know to split households. Every family has its own, which creates frictions among the in-laws. Some people put ham in it, which is quite at odds with the imperative that no meat should be eaten on Christmas Eve. Also, potato salad with ham in it is much inferior to the classic Viennese potato salad, which is served in our families and is therefore clearly the best (wink wink). To top it all up, the leftovers of the cried carp are pickled and served a few days later as “Pecenace”. Sounds pretty bad but it is delicious. If you want to tried this, head over to Cestr. It is one of the most surprising and favorite dishes we serve in some of our food tours. The cruelest Czech Christmas tradition is the Christmas Eve fast. You don’t eat anything until the dinner so that you get to see the “golden piglet”. In theory. Because in practice you are simply defenseless against the smells of the sausage with wine, the carp, fish soup and potato salad, so you simply nibble away here and there. Another tradition is the “vanocka”, the classic Czech Christmas bread that is dense and tastes a bit like brioche bread and often includes raisins and almonds. If you want to taste a great version, head over to Maso a kobliha. They sell a great version made by Juliana, arguably the most famous bread blogger around. One of the most important, and surely the most fattening, Czech Christmas traditions is the baking of Christmas cookies. In many families, Christmas baking ends up dominating all December weekends, really, at least among moms and their daughters. All the advertisements in the media before Christmas tend to revolve around butter, cocoa powder, sugar and nuts, only to be replaced in January by advertisements for gym memberships and low fat yoghurts. Yes, the calorie intake over Christmas is huge but you know what? The cookies are delicious so who cares? Christmas baking may at time get competitive, as people reunite at work on Mondays to top their colleagues with the number of the different varieties they prepared over the weekend. The idea is to make the Christmas cookies as small as possible and to prepare as many different varieties as possible. The most convenient storage compartment for the cookies is the humble shoe box, so when you walk through the residential parts of Prague over the holidays, you may spot a few boxes here and there on the balconies. Now, every family has a repertoire of “tried and tested" cookies that cannot be missing on the Christmas table. 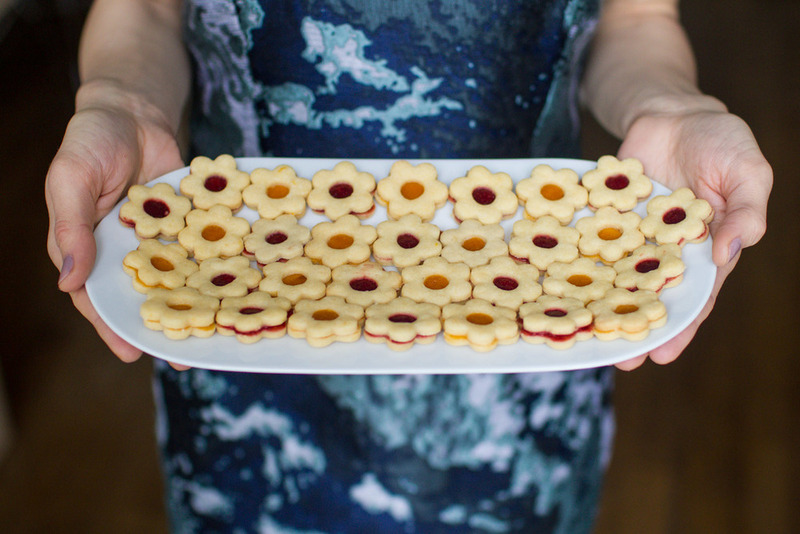 Now you can bake your own with Zuzi’s grandma’s recipes for the Linzer cookies and vanilla crescents, two of the classics. Be careful: both are highly addictive and you may end up making several more batches and putting on more weight than you had originally planned. Which is probably the most traditional Czech tradition of them all. In any case, we wish you a Merry Christmas! Bake responsibly, ok? I always start with setting oven to 180 C° (350 F). Then I place the almonds on a baking sheet and bake them for about 9 minutes. In the meantime, I sift the flour to another bowl and then I stir in the salt and lemon zest and I put the bowl on the side. When the almonds brown slightly, I remove them from oven and let them cool down. Then I place them into a food processor and grind them finely. Then I add 40 g of sugar and grind the almonds again. I put butter and the rest of sugar in the bowl of my electric mixer and beat (on moderate speed) it together until the mixture is light and fluffy. It usually takes about 2 minutes. Then I add vanilla beans and egg yolks and I beat the mixture again for about half a minute. Finally, I put in the ground almonds and the flour mix and I mix everything together again for about a half a minute. I divide the dough in half, cover each half with plastic wrap, and refrigerate the dough overnight. The next day, I preheat the oven to 180 C° (350 F). I put parchment paper in three baking trays. I always cut the cookies and put them on the baking sheet one by one, leaving about 2 cm (about an inch) between them. Then I re-roll all the scraps and cut out the remaining cookies. When the baking sheet is full of cookies, I put it in the fridge for about 10 min before baking and I keep cutting cookies for the remaining baking sheets. I repeat this process for all the dough. After letting them rest in the fridge for 10 minutes, I bake the cookies for about 6 minutes (this depends on size of cookies, so if you do small shapes, it’ll take about 6 min, but if you do bigger shapes, it can take about 12 minutes. I always look for a nice, yellowish color with very light brown color around the edges). I remove the cookies from the oven and leave them cool. Then I mix a shot of fragrant alcohol with the jam. When the cookies are cold, I spread a thin layer of jam on the bottom surface of the full cookie (I never quite know what a thin layer is, and I love this jam with little booze in it, so the first cookies usually end up in my mouth since they are so messy I could hardly show them to anyone ;-)), place the cookie with the hole on top of the jam and gently sandwich the two cookies together. You can add a little bit of jam to fill in the hole in the cookie with a spoon. I like these cookies the best when softened, which takes about a day. If you prefer a crunchy structure, I’d fill in the jam on the day of serving. I always mix all the ingredients together and knead them until they form a dough that does not stick. Then I wrap the dough into baking paper and leave it overnight in the refrigerator. The next day, I switch the oven, set the temperature to about 165 °C and fit the parchment paper inside medium sized trays. When I'm happy with the crescents, I put them on the tray and when it's full, I put the tray into the oven and let the crescents bake for about 8-10mins until they get a bit pinkish. I take them out of the oven and let them sit to cool down a bit (3 min) and then coat them in vanilla sugar. Enjoy the holidays and eat responsibly!